We’d like to welcome Robyn back to Tips for Family Trips! Robyn and her family were recently hosted by Oklahoma City so that we could share travel tips and inspiration for this great family destination in the Midwest United States. We begin her series with one of the best known and most important destinations in Oklahoma City, Oklahoma. On April 19, 1995, at 9:02 a.m., the Alfred P. Murrah Federal Building was bombed by U.S. born terrorists and 168 people died. The Oklahoma City National Memorial and Museum honors those who were killed, those who survived and those changed forever. The Memorial is both indoors and outdoors so you should check the weather and dress appropriately. We visited the Memorial and Museum on a cold day in January so we needed coats and hats. The first portion of the museum is indoors, but if you want to be able to walk amongst the 168 chairs outside by the reflecting pool, which is well worth it, I recommend you dress for the weather. The museum is on several levels accessed via elevators or stairs. The museum is fairly large spanning three floors, and as mentioned, indoors and outdoors, so comfortable shoes are a must. Elevators are available. Parking is available on the street for up to 2 hours via meter or in the parking lot behind the building for $5. We were there on a Friday morning in January and had no trouble finding parking on the street. Weekends may be busier. As you make your way into the Memorial, you may pass by the Fence originally installed to protect the site of the Murrah Building. Almost immediately after the bombing, people began to leave tokens of love and hope on the fence. Those items now total more than 80,000. You might consider bringing your own token to leave on the Fence. The Memorial and Museum recently underwent a $10 million upgrade.My husband visited the Memorial over 10 years ago and as we went through it, he commented that there were things he did not remember. We later found out that the Memorial did indeed receive a major upgrade recently, adding digital features to keep the attention of younger visitors, as well as a picture window overlooking the outdoor portion of the Memorial, and the Investigation floor showing pieces of evidence that led to the capture of the bombing conspirators. 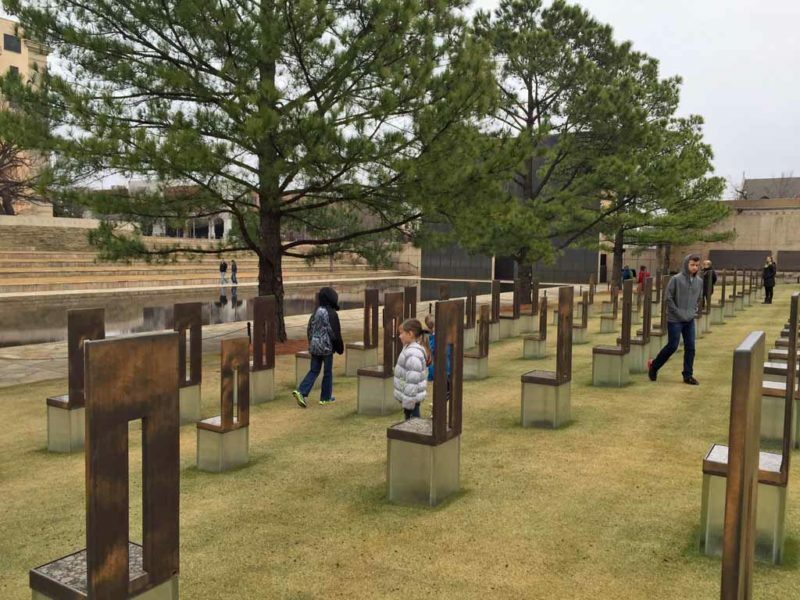 If you haven’t been for several years, you may want to visit again and see the new additions to the Oklahoma City National Memorial and Museum. We have four children, ages 6-14 and I felt like they were able to enjoy the Memorial and Museum. Our 6-year-old son is still learning to read so the digital features of the Museum saved his attention span in each of the rooms. The Oklahoma City National Museum and Memorial are visually stimulating and well done and I was able to enjoy it, even with young children. We spent two hours at the Oklahoma City National Memorial and Museum and I probably could’ve stayed twice as long if not for the aforementioned 6-year-old. He kept us moving along through the rooms a little more quickly than I would’ve gone on my own, but I was able to enjoy the Memorial in the two hours I had. There is a guest book on the lower level just before entering the room with the picture window overlooking the Memorial. Our younger children especially enjoyed signing their names. Tears came to my eyes as we walked through the Oklahoma City National Memorial and read stories of sacrifice and heartbreak. If you are emotional or have a personal connection to the Memorial, you will definitely want some Kleenex on hand. Consider a stop in the Memorial Store for special gifts and keepsakes. Your purchases will help support the Oklahoma City National Memorial and Museum. Our 8-year-old daughter wanted to spend some of her own money on a rescue dog stuffed animal from the Memorial Store. There are many different items in the store, including historical books about the event that changed Oklahoma City forever. When: The museum is open 9 a.m. to 6 p.m. Monday through Saturday and 12 p.m. to 6 p.m. on Sundays. The museum is closed Easter Day, Thanksgiving Day, Christmas Eve, Christmas Day and New Year’s Day. The Outdoor Memorial is free and open 24 hours a day, 365 days a year. National Park Service Rangers are on the site daily, except Thanksgiving Day, Christmas Day and New Year’s Day, to answer questions. Rangers are available from 9:00 a.m. to 5:30 p.m. I haven’t made it over to this memorial yet. It looks very well planned. Looks like a lovely and touching memorial. That National Memorial is beautiful. I had no idea it was there. I think it’s so important to take kids to these places. So glad you did and are recommending it to others. We visited last night. Very touching…historic …everyone should feel the presence of emotion and heartache. So glad we came…so very sorry for everyone that has been impacted by this tragic event.